Mix melted butter, garlic powder, salt, and parsley flakes. Toss bread in a medium bowl with butter mixture until pieces are evenly coated. 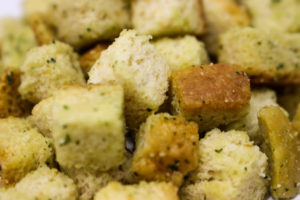 Let croutons cool before serving. Enjoy the Gluten Free Crutons!